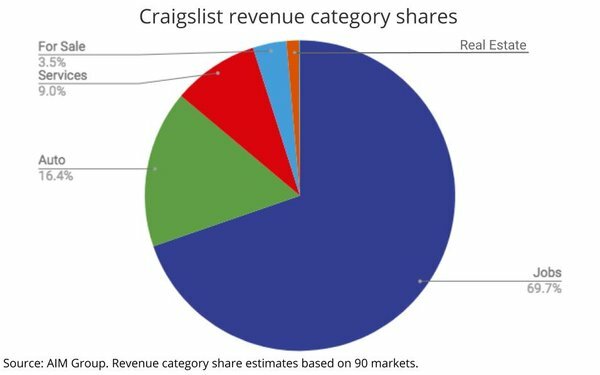 Craigslist surpassed the $1 billion revenue mark for the first time in 2018, according to estimates released this week by the AIM Group’s Classified Intelligence Report. 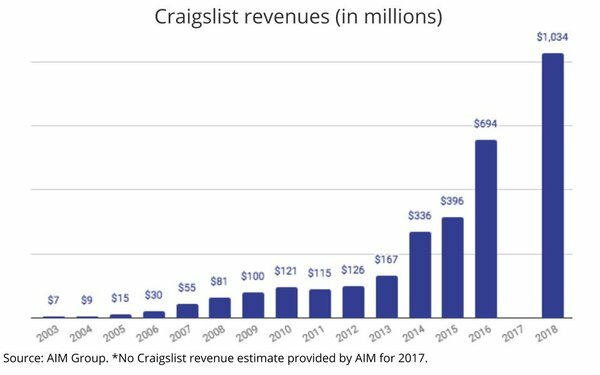 AIM did not provide an estimate for 2017, but shows that Craigslist’s revenues expanded 49% over 2016’s $694 million, the last year it has an estimate for. AIM’s data shows Craigslist's year-to-year revenue growth has been incredibly volatile since it began tracking it in 2003 -- doubling in some years while declining in others -- and 2018’s growth doesn’t come without another form of volatility. While revenues are once again soaring, Craigslist’s traffic has been “dropping steadily since about 2015,” according to the AIM report. AIM cites several factors, including the elimination of Craigslist’s controversial “personals” listings, as well as greater competition from niche online classified listings publishers, as well as big platforms such as Facebook’s Marketplace.